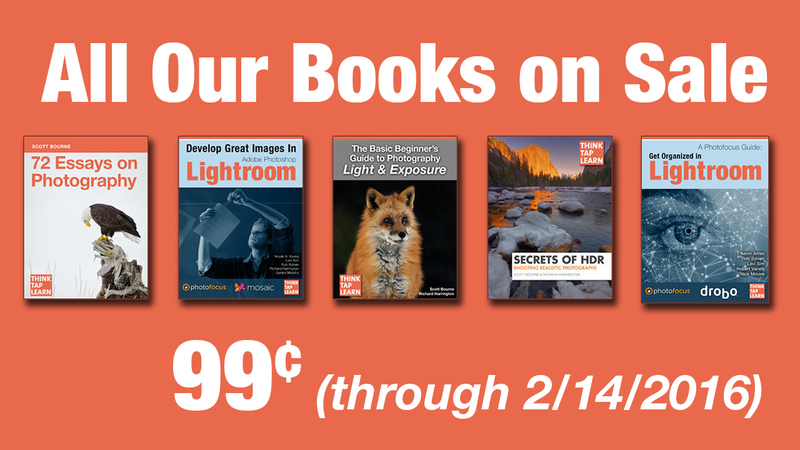 How’d you like more than 750 pages of photo education and inspiration for less than $5? Our eBooks are on sale for just 99 in the United States. We’ve asked iTunes to price equivalently around the globe. The sale runs until February 28, 2015. The collection contains text, photos, video, audio, and interactive content. NOTE: These books require the App iBooks to view. This currently runs on an iPad. The iBooks currently require an iPad, iPad mini, or a Mac. The 72 Essays book is on sale at Amazon.com for all platforms. Any plans on releasing these eBooks in PDF (or other non-iOS, perhaps more universal) format like the “Get Organized in Lightroom” download? I don’t own an iOS device and it would be nice to have them available on my Droid tablet. Thanks for the consideration. Some of the books have video and rich interactivity built in which doesn’t translate to static media formats like PDF or EPUB (the exposure and HDR book). But the other 3 are there at the bottom of the article. i would like to obtain these books for under $5 but on going to itunes as you suggest, the price listed is $9.99 for some of these books. Your advice please. Myself and several of my friends are very interested. Sorry the sale was good until Feb 14 2016 so you’re about a year late.